Participants in the ecumenical gathering at St. Vartan. NEW YORK – (December 11, 2012) Archbishop Khajag Barsamian, Primate of the Diocese of the Armenian Church of America (Eastern), hosted an ecumenical gathering at the Diocesan Center in honor of the elevation of Archbishop Timothy Dolan, the Roman Catholic Archbishop of New York, to the rank of Cardinal. Leaders of the Roman Catholic, Eastern Orthodox, and Oriental Orthodox churches came together at St. Vartan Armenian Cathedral on November 30 for a prayer service, followed by a reception to honor Cardinal Dolan. Also attending the afternoon gathering was Rabbi Arthur Schneier, the Founder and President of the Appeal of Conscience Foundation. Archbishop Barsamian also welcomed Metropolitan Tikhon, the Primate of the Orthodox Church in America and Metropolitan of All America and Canada, who was elected to this position on November 13. Cardinal Edward Egan, the former Roman Catholic Archbishop of New York, delivered the invocation. He thanked Archbishop Barsamian for organizing the day’s program and congratulated Cardinal Dolan on his elevation. Archbishop Dolan was elevated to the College of Cardinals by Pope Benedict XVI in February 2012. Cardinal Dolan expressed his gratitude to Archbishop Barsamian for the warm reception, and recalled how in the fall of 2009 the Eastern Diocese hosted a similar gathering to mark Dolan’s installation as the 10th Roman Catholic Archbishop of New York. “You have been a source of hospitality and warmth from the beginning,” Cardinal Dolan said. He said that it is important to maintain the bonds of friendship shared by the various churches in New York, especially in a culture that sometimes characterizes religion as a source of violence. “Now more than ever we need the unity and fraternity that we have here in New York,” he said, adding that together the churches can stand up to injustice and seek peace. He congratulated Cardinal Dolan on his elevation and commended his tenacity and his readiness to defend the Christian faith. “It is important that we have leaders with a determination to change the world,” Archbishop Demetrios said. Metropolitan Mor Cyril Aphrem Karim, leader of the Syriac Orthodox Church of the Eastern United States, remarked on Cardinal Dolan’s many achievements in a short period and his commitment to serving his flock. “At a time when faith has diminished in public quarters, it is important to bring faith to the public sphere,” he said. He also spoke of the suffering in Syria, and called on religious leaders to pray and to advocate for peace in the region. Rabbi Schneier reflected on the importance of living one’s faith through good works. “You serve not only your church, but you serve all of God’s children,” he said to Cardinal Dolan. Metropolitan Tikhon presented Russian Orthodox icons to Cardinal Dolan and to Archbishop Barsamian. “We offer you our prayers, and on behalf of the Orthodox Church we look forward to working with you,” he said. At the conclusion of the afternoon meeting, Metropolitan Philip, the Antioch Orthodox Church’s Archbishop of New York and Metropolitan of All North America, delivered a benediction. Also in attendance were Bishop Nicholas DiMarzio and Bishop William Murphy of the Roman Catholic Archdioceses of Brooklyn and Long Island, respectively; Archbishop Mor Titus Yeldho of the Syriac Orthodox Church; Bishop Michael of the Orthodox Church in America; and Bishop Nicholas of the Antiochian Orthodox Church. Fr. Moises Bogdady represented Bishop David of the Coptic Orthodox Archdiocese of North America; Fr. Kess Mahitama represented Archbishop Abune Zekarias of the Ethiopian Orthodox Church; and Fr. Thomas Garabedian represented Bishop Mikael Mouradian of the Armenian Catholic Eparchy of the United States and Canada. In addition to Archbishop Barsamian, representing the Eastern Diocese at Friday’s event were Archbishop Vicken Aykazian, the Diocese’s Ecumenical Director; Archbishop Yeghishe Gizirian; Very Rev. Fr. Simeon Odabashian, Diocesan Vicar; Very Rev. Fr. Mamigon Kiledjian, Dean of St. Vartan Armenian Cathedral; Very Rev. Fr. Daniel Findikyan, Director of the Diocese’s Zohrab Center; and the Rev. Fr. Mardiros Chevian, Dean of St. Nersess Armenian Seminary. 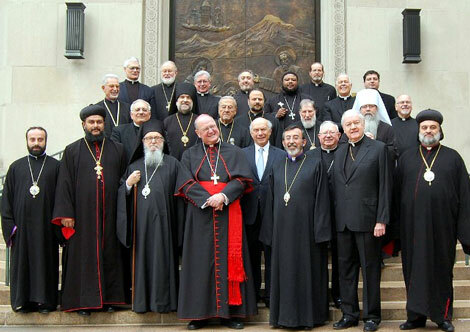 Bishop Armash Nalbandian, Primate of Damascus, who is visiting New York, also took part in the gathering.